This was just one instance. There are much more hidden and spectacular features on your Windows PC now that make it way too quick-witted. Indeed, Windows computers are a life saver. These amazing tools/features can do things in a jiffy for you, without letting you download any other third-party tool. Check out the extra hidden but amazing features you probably don't know that Microsoft Windows implemented already for your use. We already saw Windows 10 tips tricks and hacks or GODMODE, but these are less explored features you don't know existed. Today we are going to see one of the most important post on hidden features that you must aware while using Windows PC. With every system update and a newer version, Windows has just gone far behind than anyone could expect. 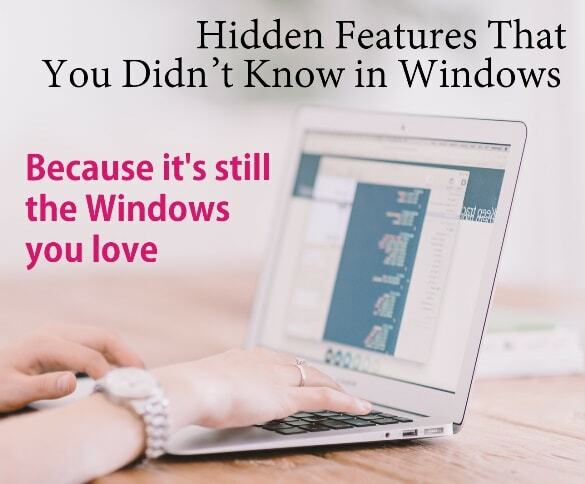 We have compiled a list of 7 hidden features that you didn't know exist in your Windows. Take a look and you can thank us later. To start off with, Microsoft has embedded a memory checker for you. The tool is named as ‘Windows Memory Diagnostic’. When you run this tool, it restarts your system and tests the memory for errors. Precisely, it digs out memory errors. For instance, false memories, misinformation effects, and many other errors. They are accessible from your system, and you don't need any third party tool for this. Windows Registry should be credited for its operations (and they are also the culprits for improper operation). Henceforth, the Registry plays a significant role on your Windows. For the uninitiated, these are a set of automated database, which helps Windows behave the way it does for you. But every time you uninstall any program, it leaves its leftovers in the 'Registry' section and affects its operations. You can take control of your system with Registry Editor. Further, registry editor can also help you speed up Windows XP and all others versions. Just type ‘regedit’ at your start/ search menu and edit your Windows. Note: Be careful while editing Registry. The wrong rearrangement can lead to pernicious effects. System Information tool helps you figure out everything that exists on your system. This inbuilt utility can be extremely helpful for you to know information about the system like CD-ROM, configured environment variables and start programs. Though this tool doesn’t provide you the slightest of system component information but will give you a fair idea of what exists on it. It can great replace the system information provider tools that you may download for the purpose. Microsoft must be smart enough while designing this canny utility. Problem Steps Recorder helps you oppositely when you need remote access, but unfortunately, it isn’t working. You simply need to search ‘psr’ from the start menu and click on ‘Start Record’. The tool then records all the activities via screenshots, in an array and convert it into HTML web browser compatible document. You can send the recorded document through email and get the assistance for your concern. Well, this is an added feature to all the old ones. And apparently, it’s for you to enjoy Windows 10. You can run a virtual Windows 10 to your existing machine (or operating system) and check the updates as well as working of Windows, before you actually install it. The virtual machine will give you a fair idea about the new updates rolled out in Windows 10. You can get it done via online sources. This is again a Windows 10 update and undoubtedly it’s a bang on one. Windows 10, allows you to personalizes your system properties. Like you can resize the window, change the background to transparent, word wrap and many more. You’ll find this feature under properties. So, head on and customize it according to your preferences. You must be in need of a tool which can convert document files to PDF files. And more often than not, you download a third party tool for this task. However, this feature already exists in your system, and you shouldn’t be looking for a third party tool for the same. Just find the option ‘Save As’ under ‘File’ tab and save any document into PDF. Henceforth, keep them safe! These are 7 hidden features on your Windows that can make it peculiarly. And yes, need not say, it eliminates the need for all third-party tools on your system. Further, it can help you speed up Windows XP, 7, 8, 8.1 & 10, by primarily performing their task and secondly by retrieving the space you'd give to those sluggish tools otherwise. Author Bio: Yogesh Sharma is working at systweak, as an SEO Analyst and Technical Content Writer. His forte of writing is ransomware, virus, windows, and mac and he is keenly interested in writing other technical blogs. You can also find him on Facebook, Twitter, and LinkedIn.